Z Marine North America (Zodiac Nautic), a subsidiary of world-leading inflatable and Rigid Inflatable Boat (RIB) manufacturer Z Nautic Group (Zodiac), has announced the launch of the new Zodiac OPEN 5.5 in the Americas. The versatile, 17’7” RIB made its debut at an exclusive, day-long media event in greater Charleston, S.C., home to the facility where Zodiac RIBS are assembled in America. An adventurer-style Rigid-Hull Inflatable Boat (RIB) with sleek lines, the new OPEN 5.5 offers a perfectly ergonomic cockpit and an exceptional reinforced deep-V hull, with control and stability even in rough conditions. “The Open 5.5 fully expresses Zodiac’s DNA. Its versatility makes it a unique concept, matched nowhere else on the market, in line with its new slogan: ‘Keep Exploring’,” said Dominique Heber-Suffrin, CEO of the Zodiac Nautic Group. For 120 years, Zodiac has been making every moment on the water an unforgettable adventure. 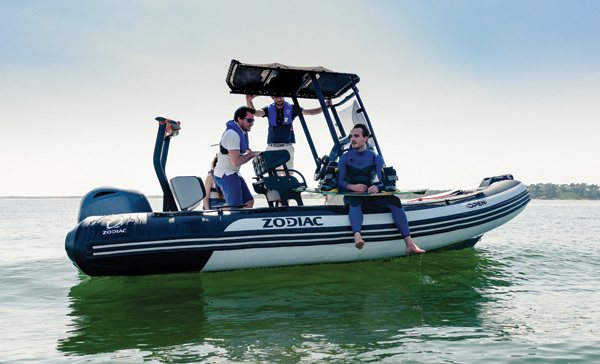 With extensive production, distribution and customer service operations worldwide, Zodiac is the world’s largest and oldest manufacturer of RIBs, inflatable boats, life rafts and safety equipment. With over 1 million boats sold, Zodiac is positioned and ready to help you Keep Exploring!